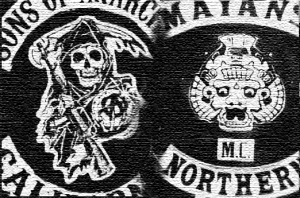 You are reading this and you have an interest in the MC world, so then you have probably seen or at least heard of the Sons of Anarchy TV show. Some hated it, and some loved it. Either way it is undeniable that the show had an effect on how the public sees our MC world. AND, for the most part, the world sees us being bad guys, everyone of us. I look at the show the way I look at all media products about our MC world. They care about two things, making money and fame. They don’t care about the truth or how their products affect real people, the many men, and their families who live in the MC world. They make entertaining shows that are designed to get an audience so that they can make money and make the producers and actors famous. Period. What is Bikerstrong.com all about? It is about the truth about motorcycle clubs and the biker world. We are not a bunch of worthless scumbags like the media and law enforcement would have the public think. That is why I wrote and published Get Patched. It seems that every book out there about our MC world was either written by a cop, a snitch, someone out bad, or some ego centric MC member who just wants to self-aggrandize himself or his club. Privacy is #1. We don't share your info with anyone. You can cancel at anytime. 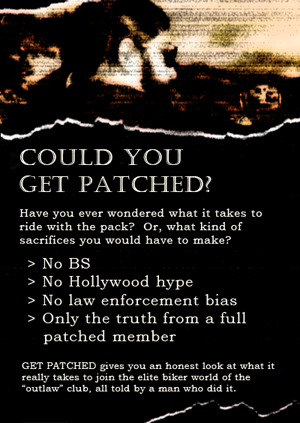 Have you ever wondered what it takes to ride with the pack? Or, what kind of sacrifices you would have to make? Only the truth from a full patched member. 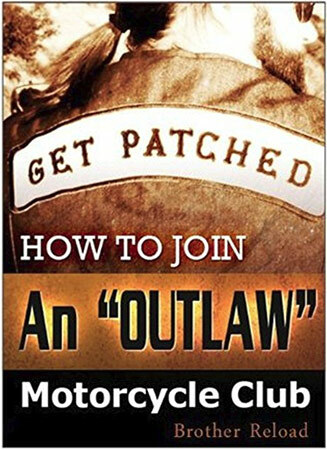 Get Patched gives you an honest look at what it really takes to join the elite biker world of the “outlaw” club, all told by a man who did it. This book is back! This book was taken down by the author some time ago but has now been republished. If you are one of the many who have reviewed read and reviewed this book it would be appreciated if you could repost your review.